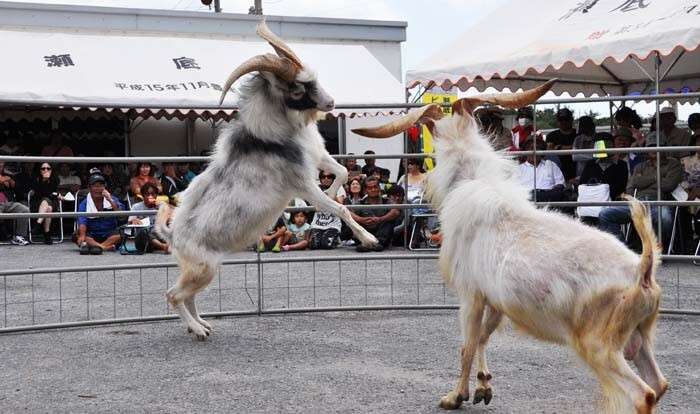 Goat fighting is said to be more dynamic than the more familiar Okinawan bullfighting. The Motobu Tourism and Culture Festival was scheduled for this Saturday, but approaching typhoon Malakas made organizers to change their minds, and the festival is now re-scheduled for Sep. 24. 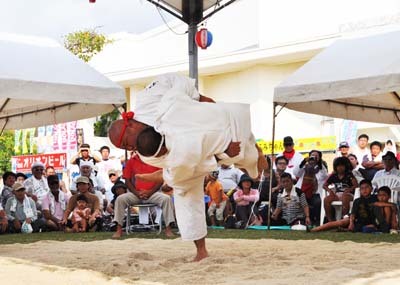 Besides the animals, men also compete to see who’s the strongest in Okinawan-style contest. The festival is organized for the 10th time, and like previous years, people in Motobu have made sure that their festival is completely different from countless other festivals that take place in Okinawa’s towns and villages almost every summer weekend. To begin with, the festival is actually a night event, starting Saturday at 19:00 at the Motobu multi-purpose event space (bullring) in Urasaki, Motobu Town. Tickets to the event cost ¥1,000 in advance and ¥1,500 at gate. However, children under 18 of age are free. The tourism and cultural festival’s goal is about expanding Motobu Town culture and creating a more active town, while also getting more Tourists to visit the town. 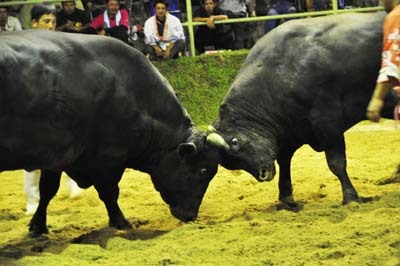 Okinawan-style bullfighting tournament is also on the menu of the day in Motobu. The main events at the festival are bull and goat fights, while Ryukyu folk music performer Shuken Maekawa fills in with the entertainment. Sesoko Island off Motobu town is famous for their goat fights. Although the “sport” disappeared once in the 1970’s, they were revived and since 1995 goat fighting tournaments have taken place every year in May and November. People familiar with goat fighting say said that goat fights are more dynamic than Okinawan style bullfights. The event ends with a lottery with the lucky winner taking home a live goat that could, perhaps, be groomed into a new champion. The lottery numbers are printed on the entrance tickets. Advance tickets are sold in all hotels in Motobu town, Motobu Kariyushi Market, Motobu Town Sightseeing Association Office, Motobu Town Chamber of Commerce and Industry and Road Station Kyoda.